Sue Isle, March 2011. 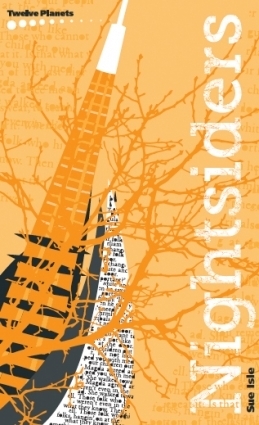 Every time I get sick of the indie presses — thinking they just don’t attract quality authors and then don’t have the editorial skill to turn around the mediocre manuscripts they do get — a book like Nightsiders comes around to prove me wrong. This slim paperback from Australian indie Twelfth Planet Press is a haunting dystopia with just enough plot to keep the story going while the world is built via the experiences of a set of well-drawn characters. There are four long stories or short novellas included, all set in the same futuristic Australia after a time of extreme climate change, each told from a different POV. The book opens with teenage Kyra escaping from the tyrannical woman who raised her and finding comfort in a new, created “family.” Next is Ash, who’s struggling to rid himself of his female body, but he needs connections, support, and money even to get to the hospital. Then comes Shani, whose job involves hunting through civilization’s ruins to find goods useful to her tribe — like batteries, medicine, or even an old screenplay that her little gang of actors can stage. Finally we meet Ellen, the only non-adolescent narrator, who teaches academic subjects to the kids in her tribe but is convinced to adapt to the times. At only 138 high-interest pages, this will appeal to reluctant readers as well as dystopia-loving bookworms. Highly recommended. This entry was posted in 2011, australian, drag, dystopia, gaytopia, problem novel, queer adult, queer protagonist, realistic, short stories, Sue Isle, trans. Bookmark the permalink.